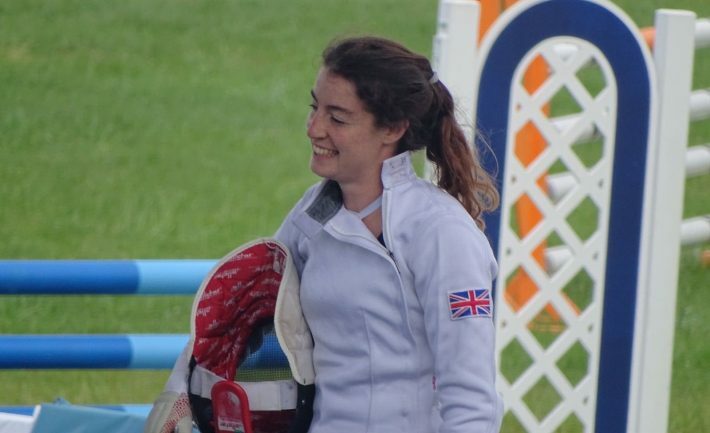 Fotheringhay’s Jess Varley and Plymouth’s Myles Pillage finished 6th in the Mixed Relay on the final day of the 2017 Senior European Modern Pentathlon Championships in Minsk today. In a field containing many athletes with more experience, including several Olympians, the young British duo held their own throughout the day to finish in a commendable 6th position. Both athletes were making their second appearances of the week having competed in the Women’s and Men’s relays respectively on the opening two days of the Championships and comparing the two competitions, Varley commented “I was really pleased with my performance today, particularly as my swim, fence and laser run were all better than in the Women’s Relay last week. The day started with the swim, where good teamwork saw 19-year-old Pillage and 22-year-old Varley record a time of 1:59.12, the fifth quickest in the field. Varley and Pillage who teamed up finish 4th in the Mixed Relay at the opening World Cup of the season in Los Angeles then moved to the fencing salle where they recorded 17 victories and 23 defeats, picking up 195 points. It meant that the University of Bath based duo were 8th after the opening two disciplines in the Belarusian capital. On a twisty and technical course, a strong ride, knocking just two poles down, saw the Brits score 269 in the horse-riding stage, moving them up a position ahead of the concluding laser run. An impressive display on both the track and range from the British pair saw them pick up another place in the final discipline, crossing the line in 6th to cap a fine day in their first ever Senior European Championships. The mixed relay rounded off a mixed Championships for Pentathlon GB athletes which started with Varley and Charlie Follett finishing 5th in the Women’s Relay on Tuesday and Pillage and Bradley Sutton 11th in the Men’s Relay the following day. The individual competitions saw Kate French lead home the British women in 7th with Joe Choong the top placed man in 13th after food poisoning affected the men’s performances in their final.